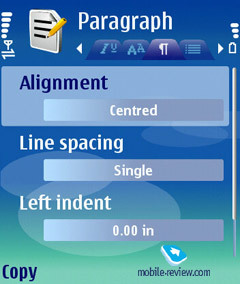 Over at Nokia they have been forced to attune not only hardware filling, but also software kit of handsets in order to meet the requirements of the enterprise market; and the latter part of work deserves most positive reports, as just a piece of hardware won’t ensure good sales – to the developers’ credit software researches were done very well. Back in the days, companies desperate for acquiring enterprise solutions for empowering performance of employees were extremely limited in choice: in fact it was all about Research In Motion (RIM, Blackberry communicators) and Windows Mobile. 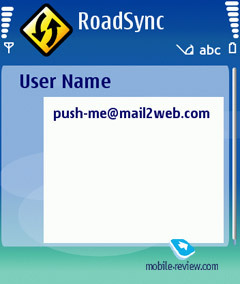 RIM devices were proved to be best for mailing purposes, while Windows Mobile was far superior when it came to synchronization with Microsoft’s products. The balance of forces has altered radically with the advent of Nokia Eseries and basically it’s a good chance to give Nokia’s works an in-depth test. One of the most demanded feature among enterprise users is VoIP-telephony (communication within the bounds of a company’s very own network, allowing companies to save some coins on external calls). 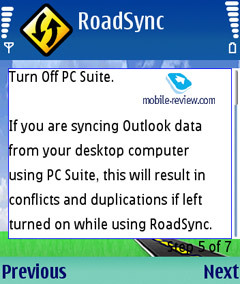 Despite the fact that this function is still far from perfection (check out a special article on that), its very presence turns out to be a significant competitive edge over Windows Mobile. Even today one can experience its almost infinite potential, which is more likely to be developed in the near future – all that is left to do is enhance its stability and compatibility fronts. Blackberry-branded communicators also flaunt VoIP protocol, however they are spread not so widely – some regions haven’t seen the release of them yet, Russia is on this list as well. For fairness’ sake we are to say that for Windows Mobile there is Skype client being available, whereas Nokia lack such capability; nevertheless that Skype is targeted more at individual use and small-scale business. 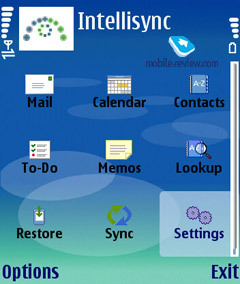 Basic functionality of the operating system don’t set the world on fire for it is just Nokia S60 3rd edition, feature pack 1, which was already looked into in a special article. 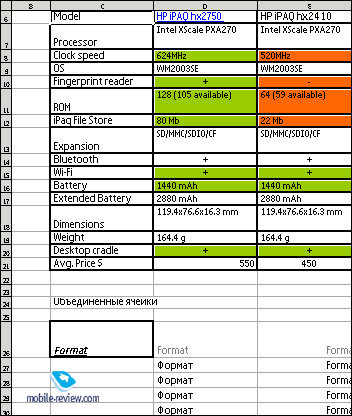 Meanwhile, the major aim of this review is finding out which extras and applications missing in standard software kit of the S60 make Eseries look and feel different from other Nokia-labeled smartphones, for example Nseries line-up. But before moving on to that, we are going to point out a number of facts you need to know. The Eseries include devices with both types of screen orientation (horizontal and vertical) and hence screen rotation feature is well-justified. Models lacking camera module cannot grant their users complementary functions like PictBridge (enabling you to print out photos outright) and photo editor. Apparently, FM-radio would be something out of place on a Eseries phone, since these devices are meant not for entertainment. A disappointing rudiment adopted from the older platform, 1 minute limit on a single sound recording is incorporated into this software kit as well. Little by little the new edition of the S60, which is, as you might already know, incompatible with applications written for previous versions, is obtaining more shareware and freeware programs for its portfolio. 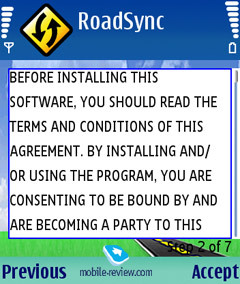 For the time being you can find more than a hundred of applications intended for the S60, therefore basing on this fact, we can rightfully state that most of essential and handy apps have already been ported to the S60 3rd edition – that is much of a progress actually, as only 3-4 months ago we were literally at a loss where to get required features. Today an all-round mobile solution for enterprise users is destined to be a failure should it lack a proper mobile mail system, so let us give Nokia Eseries a close-up and what it can offer. The standard mail client’s been covered in the review on the operating system, that’s why we will not dwell on it in this issue and rather remind you of its pros, like easy setup for most free mail boxes (Gmail.com, mail.ru, yandex.ru and others) with the help of a wizard. Unsophisticated users will find this application just fine, but replacing it with ProfiMail would make some sense, even though it is not an enterprise mail-dedicated solution either. 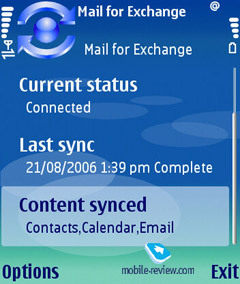 One of the most popular enterprise mail solutions is MS Exchange serves, which had been a trump up Windows Mobile’s sleeve till recently. However Nokia has licensed Active Sync protocol and implemented it in a freeware application Mail for Exchange. The program is easy to set up – all options will seem familiar in case you had previous experience of managing MS Exchange. The app’s features also include somewhat appealing settings like possibility to set a time span (for example, working days from 9 AM till 7 PM), when all data will get synchronized in non-stop mode, while during the rest of the time the program will sync on the schedule (once per hour, for example). We didn’t encounter any nuisances with the synchronization process. 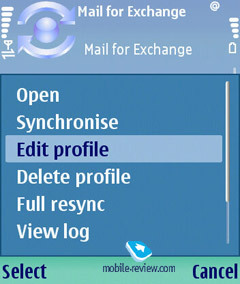 In order to see what Mail for Exchange can bring to the table, we used a free service mail2web.com, supporting Microsoft push-mail. When a contact or a new event got saved on the served, the smartphone picked them up in 15-20 seconds. Satisfied with that result, we moved on to a commercial server located in Russia – total “delivery time” made nearly 8-12 seconds. 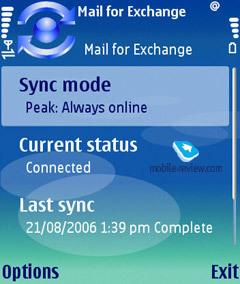 Direct comparison with Windows Mobile revealed a draw in the face-off speed-wise – our mail had been delivered almost simultaneously and the gap of several seconds is something to be easily overlooked. 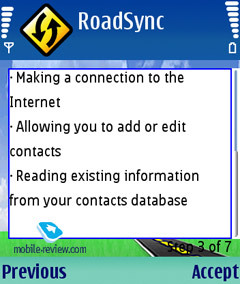 RoadSync utility created by DataViz works in pretty much the same manner as Mail for Exchange. Installation, as well as MS Exchange server connection setup don’t cause any difficulties – various wizards reduce your efforts to minimum just like on Windows Mobile. 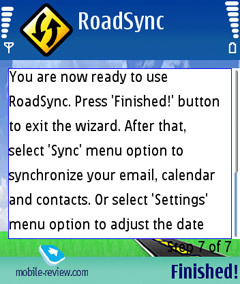 In fact, RoadSync, similarly to Mail for Exchange is an extra application acquiring access to contacts/calendar/mail on your device and synchronizing them with a server, but at that the capabilities provided by RoadSync are only nearing those of Mail for Exchange. 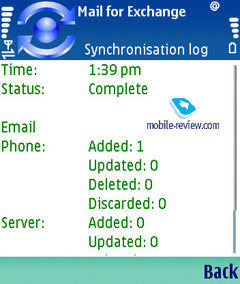 Both applications lack tasks synchronization, you cannot invite participants for a meeting when creating an event in the calendar (however not all WM-based platforms feature that option – it is incorporated only into WM for Pocket PC and missing on WM for Smartphone), but in the end these are not crucial shortcomings. 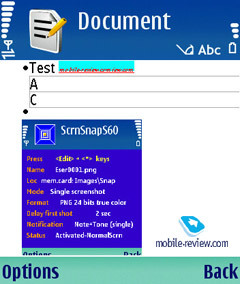 The only aspect, which is considerably worse than its rival found on Windows Mobile lies in the fact that Nokia’s solutions require an extra application to be installed, while WM initially comes included with a definitive software kit. 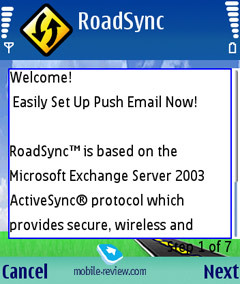 In a nutshell, synchronizing mail, contacts, and events with MS Exchange server and making latest push-technologies work with Mail for Exchange or RoadSync is a breeze. 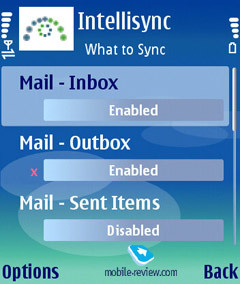 As Nokia claims, the major attraction of Eseries is Intellisync Wireless Email, which is «the only wireless email solution your enterprise needs to deliver wireless communication to all levels of employees». Support for mail synchronization with Exchange, Domino, IMAP and POP3 is onboard, but requires an additional software gateway on the server. 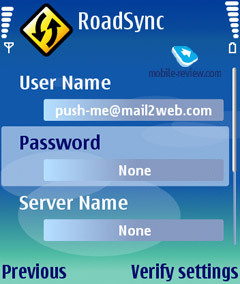 Apart from Nokia S60 powered solutions, the software kit also deals with other platforms, for example Windows Mobile, Palm OS, which will come in handy, should you need to synchronize files and other data in addition to PIM and mail. A plus of this technology is wide compatibility, push-technologies support, minus – it requires extra software packages for server. 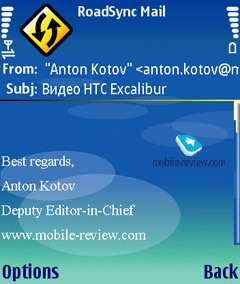 The S60 has already gotten enhanced with all most popular push-mail developments available on the market, namely BlackBerry, Visto, Good, Seven. And nobody prohibits using any of them with Eseries, but the same goes for Windows Mobile as well – actually companies are trying to come up with cross-platform solutions which would be compatible with each other. And lastly, there is SyncML synchronization support embedded. Whether enterprise users will need it or not is doubtful, but this protocol is enabled. According to the statistics more than a third of letters that have something to do with work contain various attachments (frequently office documents: Word, Excel). That is why efficient mobile mail handling must include credible tools for viewing and editing office documents. Consequentially, such software should aim at managing attachments rather than making up huge 10 Mb big files on the smartphone. The possibility to look through a received document and correct it, in case such need arises (naturally you are not likely to re-make an annual report on your smartphone), is a must for an enterprise solution. So reliability and the way a software kit processes each document’s formatting make all the difference here. 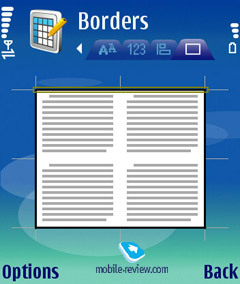 As a matter of fact, Eseries smartphone have this package embedded under the title of Attachments editor. The Eseries feature an application enabling you to view and edit documents created in MS Word, MS Excel, MS PowerPoint – before this moment, office documents management was one of Nokia S60’s greatest drawbacks despite availability of third-party tools for handling documents. It’s good to see that Eseries breaks the stereotype and introduces something new. Document. 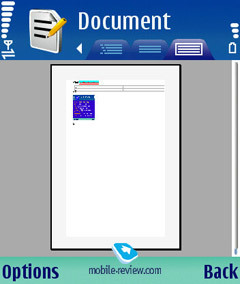 As the title implies, this application does its best when it comes to working with MS Office documents, both in viewing and editing modes all basic tools are at hand (color, alignment, font size, styles etc.). 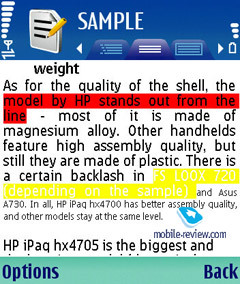 If we are to compare range of included editing features, the Nokia’s solution is slightly ahead of Pocket Word powered by Windows Mobile. You can insert a comment, link, table, image or page break into a document, but that’s not the end of the list of features – preview is also available, so that you can check out what others will see on their PCs’ screens. 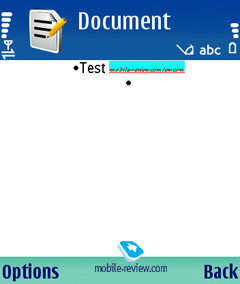 However when we tried to edit a document, we felt really upset: the test doc lost a part of formatting, running titles, and a pasted image, whereas Windows Mobile’s very own Word Mobile, on the contrary, handled it almost as it should be (there were several losses, but they could be overlooked). Sheet. This software is responsible for handling MS Excel in a proper way, which includes tables and diagrams. Functionality-wise, i.e. editing and formatting tools, it works in pretty much the same manner as Document with only addition in the form of settings for cells, at that you are at liberty to do major copy/paste, comments, links and diagrams (!) embedding work, fix certain areas and go for full-screen mode. All in all there is no way it will prove to be inferior to Excel Mobile, unless you consider absence of touch screen, which reduces its ease of use a bit, however that drawback must be attributed to the platform rather than a stand-alone application. Now let us try and edit an .xls file – the outcome should be more than intriguing, as we’ve already seen how improvidently Nokia’s software treated Word documents. And that is a really good one! 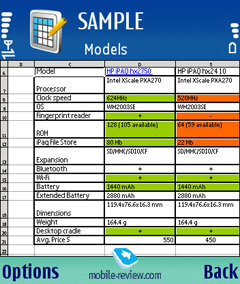 The formatting (including links, pictures and merged cells) remained almost untouched – far superior to Excel Mobile! And the last application for today is Presentation. Using it you will be able not only to watch but edit MS PowerPoint presentations as well – don’t forget that with Windows Mobile’s PowerPoint Mobile it was possible to view only, consequentially, Nokia comes out a victor here too. The conclusion following from all that is quite evident – while playing on its home field, Microsoft yields to Nokia and it seems quite unusual for the global software giant. And should Nokia grab the momentum and patch up its Document, Microsoft will have to counter it with something very special; on top of that it won’t be too long before Nokia packs all these features into a model armed with a touch screen. A third-party software kit going by the name of MobiSystems OfficeSuite enabling you to handle office applications is also worth mentioning. Frequently you will see applications come in archives, so in order to get over this impediment, Eseries include Handy ZIP application (requires installation from a CD or need to be downloaded from the official page). Documents printing. 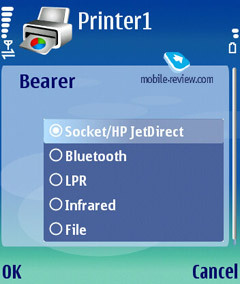 This aspect is a big focus of the software kit, for it provides a lengthy list of supported printers, advanced settings, various access points (like getting your documents printed out on a network printer via Wi-Fi, Bluetooth, Infrared or file) etc. 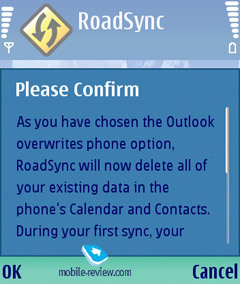 I think it’s needless to say that Windows Mobile, with none of these features being available, is far behind. On the other hand I doubt printing will be the sticking point for a company, putting enterprise mail system above everything else. 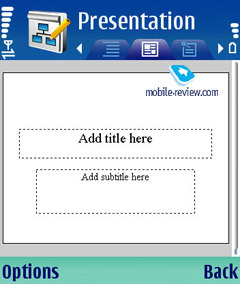 The list “office” function, which we are going to mention is Screen export – with the help of a special gadget connected to a projector, you will be able to transmit contents of the smartphone’s screen onto the big screen and literally holding entire presentations without letting the phone out of your hands. 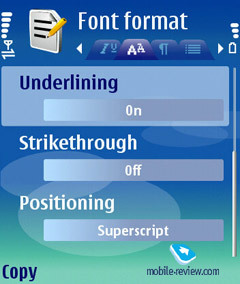 Nevertheless this feature is not a breakthrough – you could see it on Nokia 9000 series quite a while ago. The built-in backup tool has been in Eseries since distant past, however the application itself has a little to offer, thus we won’t devote a special paragraph to describing it. Should you have your smartphone stolen, the main damage will be caused not by the device’s price, but data stored on it in case “unwanted” people will get a hold of the phone. In order to avoid such nuisances, Eseries include remote blocking feature, enabling you to send a text message with pre-defined text to a stolen phone, so that its contents will get locked. But apparently, it is not a panacea – if thieves know what they are looking for, SIM-card might be switched outright, as well as the handset gotten into offline-mode. 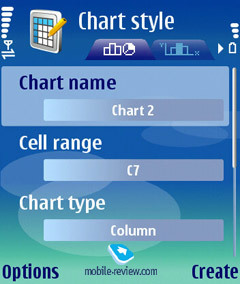 Nokia Configuration Tool. 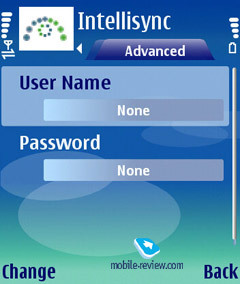 The main goal of this app is to help you in managing the smartphone’s settings and installing programs via USB-connection. 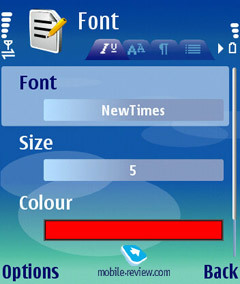 On the whole, it’s a kind of Nokia PC Suite but for enterprise users. 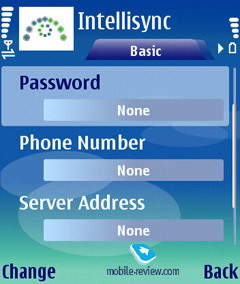 Intellisync Device Management. For the first time Nokia Eseries feature support for OMA DM (Open Mobile Alliance Device Management), which allows system administrator to tune and adjust security level, device’s settings and new applications from a remote console, so that the company could minimize the risks and reduce total expenses on security. Learn more about this feature in this document. Any anti-virus kit for smartphones is nothing more but another pacifier for managers in charge of communications within the company, as they are not of much use. Generally speaking, these were not virus epidemics (in fact there are no harmful programs which could spread over millions of phones), which called into existence mobile anti-viruses – they rather originate from a straightforward logic of an unsophisticated user: “How comes that a PC has an anti-virus program and a smartphone – does not? They are both computers, right?” Maybe this is the reason why Eseries’s special software kit doesn’t feature a default anti-virus? A few words on things not mentioned in the main part of the article, but which seem pretty fetching. Large companies often demand access to ERP enterprise system in addition to standard mail and events synchronization. In this regard Nokia has succeeded (support for SAP, IBM, Oracle), but these are still the attributes of Nokia 9000 series only. In my opinion, development of similar clients for Eseries/S60 3rd Edition is just a matter of time. No doubt it was a great surprise for Microsoft to see someone taking over its seemingly home field of enterprise solutions. The ruler of a neighboring kingdom, which had been only indulgently observing Windows Mobile’s deeds, suddenly took a decision to crusade on a minor (when compared to the kingdom) but yet a fertile princedom, occupied by WM and RIM. And if not so long ago large corporations and medium-scale business had been considered to be Window Mobile’s and RIM’s domains, with the advent of Eseries the balance of forced significantly changed, to say the least. Even though the real confrontation is yet to emerge, Eseries smartphones already have what it takes to hold an upper hand there – VoIP, powerful set of office tools and customizable mail client. All that Nokia has to do now is make the already existing features work more stable (especially VoIP) and upgrade Document application – having done that, the Finnish manufacturer will make it to the top of the hill with all required business-functions being enabled on their devices. And if that’s the case, Windows Mobile will get into a very tricky situation. Commentary. 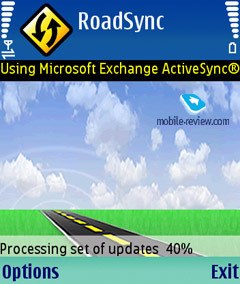 Most of the abovementioned applications are available for downloading on a dedicated Nokia’s page. Features reviewed throughout this article might be found on smartphones other than those coming from Eseries.